A short, steep, square cascade into a pool. The water falls in several streams during normal flow and it's quite photogenic despite its small size. It's in a cozy, lush setting. 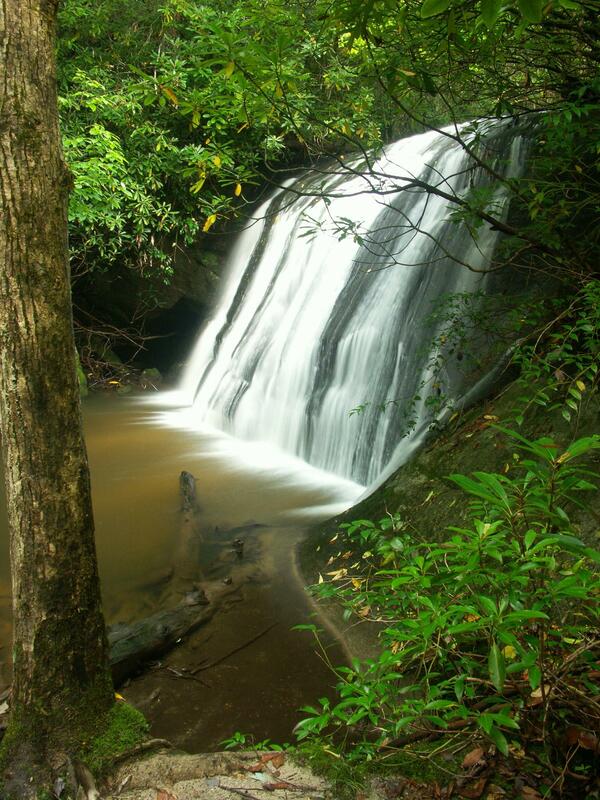 The quickest way to the falls starts at Panthertown's West entrance. From the intersection of US Hwy. 64 and NC Hwy. 107 in Cashiers, NC, go east on 64 for 2 miles. Turn left onto Cedar Creek Road and go 2.3 miles. Turn right on Breedlove Road (there is a sign for the Panthertown Valley) and go about 3.6 miles to the end of the pavement. The trailhead is about 1/4 mile ahead on the gravel road. Since the gravel road has been in very rough shape in the past, you can park here if you don't have a 4wd or high-clearance vehicle. Hopefully this road will start getting some maintenance since Panthertown is becoming so popular. This one's easy to get too, and would be a good option for families hiking in the area. Take the main Panthertown Valley trail - an old road bed - downhill from the parking area. Pass the upper junction with the Wilderness Falls trail on the right after 1/4 mile (see below). A few feet beyond, you'll pass the Salt Rock overlook; 0.35 mi beyond you reach an intersection. Turn right onto the Deep Gap trail. In another 0.35 mi. you reach the Granny Burrell Falls trail on the left. Continue straight. In just 250 ft. you reach the lower intersection with the Wilderness Falls trail on the right. Stop here. Just ahead, the Deep Gap trail crosses the creek above the falls. Look to your left instead to find a scramble path which leads down to the base of the falls. On the return trip, you may wish to take the Wilderness Falls trail, which makes for a nice loop and adds another waterfall to your hike.